Robust Economic Uptrends Remain Intact | Tellone Financial Services, Inc.
Our last blog stated that volatility was likely to rise, and it certainly has. In many ways, 2018 started off almost exactly the opposite of 2016. Over the past few years, the global economy has moved from a profits recession to an atmosphere of profits euphoria, from worries about deflation to a strong reflationary backdrop, and from a period of historically low government bond yields to a steadily rising rate environment. Both Q1 periods, nonetheless, experienced heightened volatility. The current 2018 “wall of worry” includes corporate earnings estimates, trade negotiations, inflation concerns, and technology regulation. These issues have certainly contributed to volatility (both on the downside and upside), but our thesis of market growth remains intact. Another quarter of corporate earnings is starting, and expectations are quite high. In fact, the estimated earnings growth rate for the S&P 500 in the first quarter is +17%, which, if it stands, would mark the highest quarterly earnings growth rate since Q1 2011 (at +19.5%). We will be tracking corporate earnings closely, as we believe this to be the most impactful driver to market performance at this time. The first quarter of 2018 granted investors with many lessons. Among them, it demonstrated how quickly excessive optimism can be replaced by excessive pessimism. Secondly, it was a reminder that double-digit market corrections are a normal part of bull markets. Thirdly, it was an opportunity to practice the patience and humility needed to keep detrimental behavior in check and focus on the long-term nature of our financial plans. For historical context, the S&P 500 has more than quadrupled in price since it bottomed at 666 in March 2009. During the same time, we have seen five different double-digit corrections: 17% in 2010, 22% in 2011, 10% in 2014, 16% in 2016, and 12% in 2018. The process of successfully testing the area of correction lows can occur within a period of several weeks or several months. For example, in May 2011 the S&P 500 Index began a correction which reached waterfall proportions in August. The index bottomed in early October and then rallied 94% into May 2015. The entire correction process lasted 19 weeks. The 2015-2016 S&P 500 Index correction took longer, from late-May 2015 to February 2016. Upon the final closing correction low on February 11, 2016, the market then rallied 57% into January 2018. The entire correction process lasted 24 weeks and required patience to see it through to its conclusion. In both of these examples, investors were greatly rewarded with strong stock returns by staying the course. We believe that this year’s market correction is no different. We remain cautiously optimistic and see no real signs that the economy is headed for recession or that earnings are poised to retract. Without that happening, it is hard to see how a lasting bear phase for stocks could emerge. Extraordinarily strong earnings momentum, corporate tax cuts, and fiscal stimulus underpin our positive view of economic and corporate fundamentals. One of the many signs that we monitor for economic health is the Conference Board Leading Economic Index, which is designed to signal peaks and troughs in the business cycle by looking at forward-looking factors like manufacturers’ new orders, building permits, the interest rate spread, weekly claims for unemployment insurance, amongst a few others. Since the indicator came into existence in 1959, no US recession has occurred when the LEI was rising. 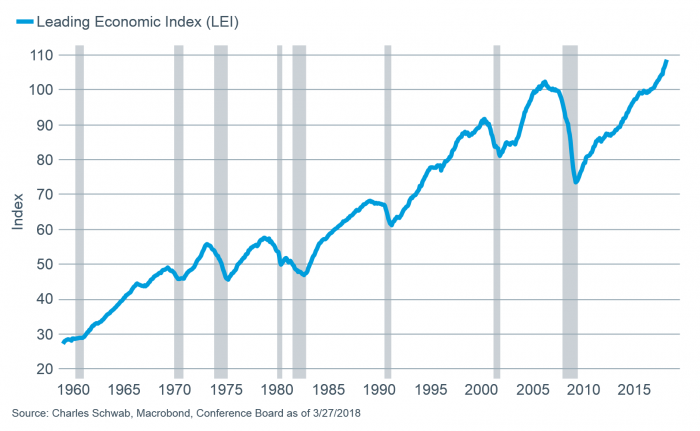 As of this writing, the LEI index is high and rising with a robust uptrend, thus signaling that economic growth remains on track. It’s easy to focus on the negatives coming out of Washington, and for good reason, but at times we can lose sight of the positives. The US economy should have a tailwind that is just beginning due to the tax cuts that the majority of Americans are just now incorporating into their budgets. Additionally, we can put worries of another government shutdown to bed, as a new spending bill passed, which should add to near-term economic growth. The corporate sector is also conveying an optimistic tone, with high readings from the Institute of Supply Management, the National Federation of Independent Business, and The Conference Board’s CEO Confidence Survey. Furthermore, announced global merger and acquisition deals totaled $626 billion for the month of March 2018, making it the third-biggest month ever for M&A deals. Over the short term (weeks and months), technical factors and sentiment tend to drive returns. Over a one- or two-year time horizon, economic and business cycle developments have usually been the most important factors. And over the long term (five years and beyond), valuations have historically been the key determinant of prices. The longer the time horizon, the less important short-term volatility becomes. These points underscore why investors must understand their own personal time horizon and risk tolerance, then diversify their portfolio accordingly so that they will be much better able to deal with volatility over time. The good news is that, in combination with higher earnings expectations and the February stock market swoon, US valuations look more attractive. In a short time frame, the forward looking S&P 500 Price-to-Earnings multiple has decreased from an above-average level of 18 in mid-January to a sub-16 level near historical averages. We have also been increasing our exposure to international stocks, which continue to show promising growth and are generally earlier in the economic recovery cycle. As long as the global economy is trending up, which it is, any dips in the market will provide us opportunities to add to our more preferred positions and to use conservative put option strategies. Conservative call strategies will benefit accounts with income when stocks hit our short-term target prices on the upside. We will continue to be active in our approach to stock selection and will make tactical portfolio adjustments as necessary.